Dymond, JN, 1994. White-throated Needletail Hirandapus caudacutus, first occurence in the Malagasy region. Bull ABC 1 (2): 78. Lucking, R. 1995. Cinnamon Bittern Ixobrychus cinnamomomeus in Seychelles, first for the Afro-Malagasy Region. Bull ABC 2 (2): 107-108. Skerrett, A. 1999. Ferruginous Duck Aythya nyroca: the first record for Seychelles. Bull ABC 6 (2): 148. Skerrett, A. 2001. 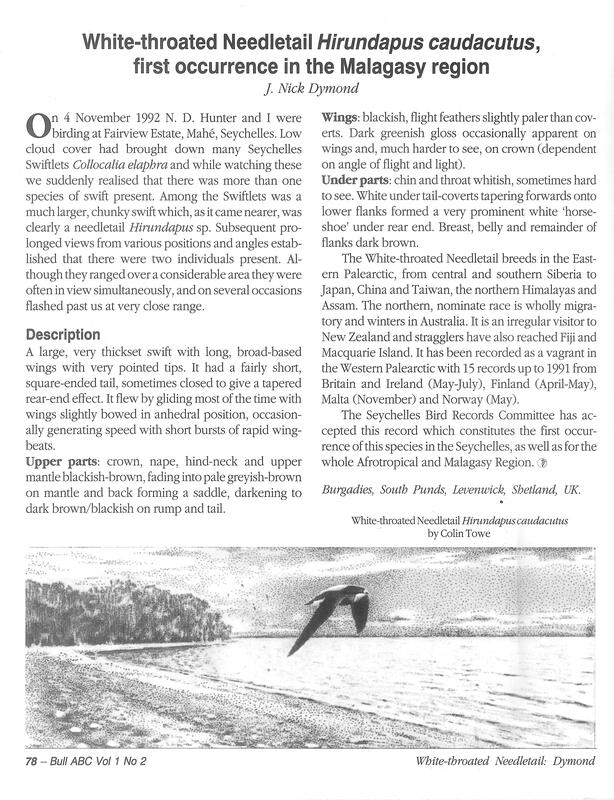 European Bee-eater Merops apiaster and Citrine Wagtail Motacilla citreola: the first records for Seychelles Bull ABC 8 (1): 51-53. Skerrett, A. 2003. Three new species for Seychelles: Sociable Lapwing Vanellus gregarius, Spotted Redshank Tringa erythropus and Chiffchaff Phylloscopus collybita. Bull ABC 10 (1): 47-49. Skerrett, A. and Roest, L. 2003. Pallid Harrier Circus macrourus: the first record for Seychelles. Bull ABC 10 (2): 126-127. Phillips, J. and Phillips, V. 2005. First record of Bimaculated Lark Melanocorypha bimaculata for Seychelles. Bull ABC 12 (1): 40-41. Hoareau C. and Skerrett, A. 2005. Glossy Ibis Plegadis falcinellus: the first records for Seychelles. Bull ABC 12 (1) 44. Tiatousse, R., Adams, R. and Skerrett, A. Squacco Heron Ardeola ralloides: the first two records for Seychelles. Bull ABC 12 (1): 45-46. Eikenaar, C. and Skerrett, A. 2006. First record of Kermadec Petrel Pterodroma neglecta for Seychelles. Bull ABC 13 (1) 88-90. Hobro, F. E. & Catry T. 2006. First record of Sooty Gull Larus hemprichi for Seychelles. Bull ABC 13 (2): 213-214. Eikenaar, C. and Bouwman, K. 2007. First record of Little Crake Porzana parva for Seychelles. Bull ABC 14 (2) 205-206. Skerrett, A. 2009. First records of Jack Snipe Lymnocryptes minimus, Tufted Duck Aythya fuligula and Plain Martin Riparia paludicola. Bull ABC 16 (2): 213-215. Phillips, J. & Phillips V. 2011. First records for Seychelles of Alpine Swift Tachymarptis melba, Desert Wheatear Oenanthe deserti and the genus Ficedula. Bull ABC 18 (2): 223-225. Andrews, D.J.R. and Skerrett, A. 2012. First records of Herald Petrel Pterodroma heraldica and Bulwer's Petrel Bulweria bulwerii for Seychelles. Bull ABC 19 (1): 75-78. Skerrett, A. 2017. First record of Greater Painted-snipe Rostratula benghalensis for Seychelles. Bull ABC 24 (1): 92-93.